L. Frank Baum's classic children's tale, The Wizard of Oz, is my favorite book of all time. I've read it as a child for practically a thousand times, never getting tired of the adventures of Dorothy and Toto, the Tin Woodman, the Scarecrow, and the Cowardly Lion on their way to the Emerald City. In fact, I credit this novel for starting me on reading. I've kept our family's hardbound copy of the novel for many years now, and it will always be special to me. So, it is with a mixed amount of excitement and skepticism - actually, it's more of the latter, really - that I picked up this supposed prequel created by Gregory Maguire. It's also the basis for the Tony-award winning musical of the same title, whose worldwide success is indubitable (I have not seen it yet, despite its having been staged here in Manila). Wicked is the story of Elphaba (taken from the initials of L. Frank Baum), more popularly known as the Wicked Witch of the West. 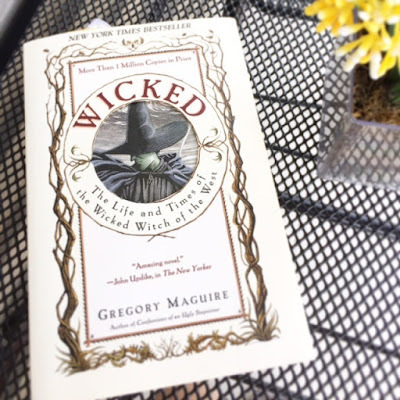 "Elphaba" is clearly coined by Maguire; in Baum's original story, she is simply known as the Wicked Witch of the West. In Wicked, Maguire creates a back story for her: where she was born, her dysfunctional family, her days as a student together with Glinda (also known as the Witch of the South), her political and romantic involvements (oh yes), and how she came to the land of the Winkies, or the land West of the Emerald City. It's ingenious, actually, how Maguire was able to take the original story and connect certain details of it to Elphaba's back story. It was interesting to read how he made Elphaba, Glinda, and Nessarose - a name he coined for the Wicked Witch of the East, aka Elphaba's sister - part of the same circle during their youth, and then from there, carved separate paths for them, resulting in the creation of their own strongholds in the Land of Oz. He ascribed certain attributes not only to the individual characters, but also to the various populations across the country: for example, the Quadlings and the Munchkinlanders. New characters were necessarily have to be created to support the storyline, and I have to give Maguire credit for his ingenuity. In this regard, I am aware than in order to weave a story using as foundation or basis an already-existing work, certain literary liberties are allowed and must be taken. I have no problem with this: tweaking the story a bit, adding details to fill gaps in the original, creating more characters. In fact, I love retellings. But for some reason, I had a few problems with Maguire's work. I felt that he overstepped his literary license in certain respects. For one, I didn't like that he reduced the "Wicked Witch of the West" into a mere label. The Wicked Witch I remember is nothing but that: a pure witch. You know what I mean. In Wicked, Elphaba is a commoner, an ordinary citizen born in Munchkinland except that she couldn't be any more common than she would want to be because of her green skin. She was depicted as a headstrong, intelligent, and kind woman, but not a witch. How could she be? The premise of Maguire's story is that Elphaba - and Nessarose as well: the Wicked Witches - weren't born "wicked." To say more would be to give away the meat of the story, so I'll stop at that. The last thing I will say is that nothing in Wicked changed the way I perceive Elphaba, Glinda, or Nessarose from the original story. And that's just one deviation from the original story that didn't sit well with me. There are other details that I won't go into anymore; suffice it to say that I didn't appreciate the drastic changes. Forgive the Oz purist in me. For another, I understood that it's supposed to be the entire life story of Elphaba - from birth to death (by water) - but it winded a tad too long. I kept reading because I was eager to know how the big confrontation with Dorothy would be created - only to be disappointed in the end. Sure, the entire retelling was creative and all. But there are just some classics that you should never go messing around with. In my humble opinion, The Wizard of Oz is one such tale better left alone.